I admit, I am one of those crazy people who goes SQUEEE! as soon as Starbucks starts selling their Pumpkin Spice Lattes. I love all things pumpkin, I just can’t help it! Remember that scene from Forrest Gump when Bubba is talking about all the ways to make shrimp? That is SO me and pumpkin.. “I like pumpkin coffee, pumpkin cupcakes, pumpkin coffee cake…..” It’s just silly how much I love all the yummys! This is one of my favorite seasonal coffee cakes. Look for other flavors later this year! It’s SO easy to make, you can throw it together in the morning, and serve alongside your favorite yummy latte and have a heavenly Fall morning! Preheat the oven to 350 and spray a 13×9 baking dish with a nonstick spray. Mix the water, pumpkin, eggs, vanilla, and pumpkin pie spice together until well combined. 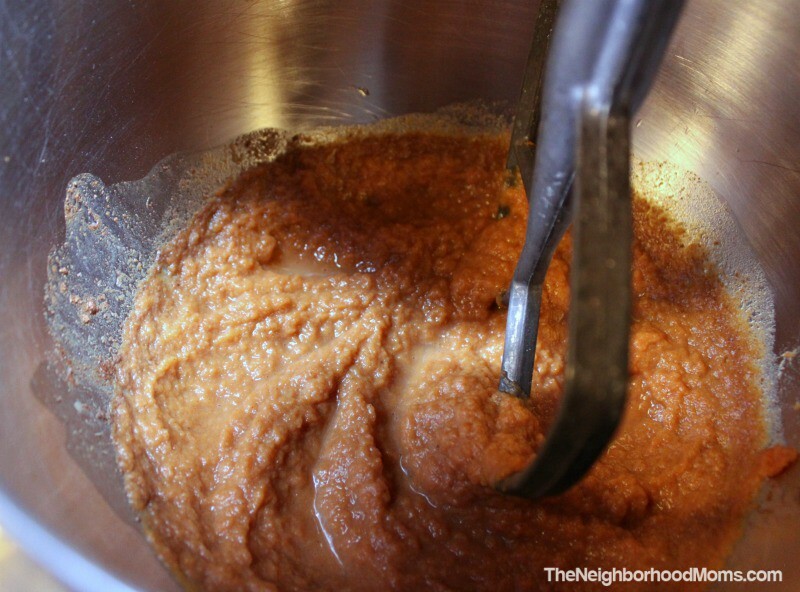 It doesn’t look very pretty, but you will start smelling the pumpkin, and it will be amazing. Mix in the yellow cake mix and baking soda. It may be against the rules to taste this batter with the raw eggs, but, I won’t tell anyone if you do! Spread evenly in the baking dish. 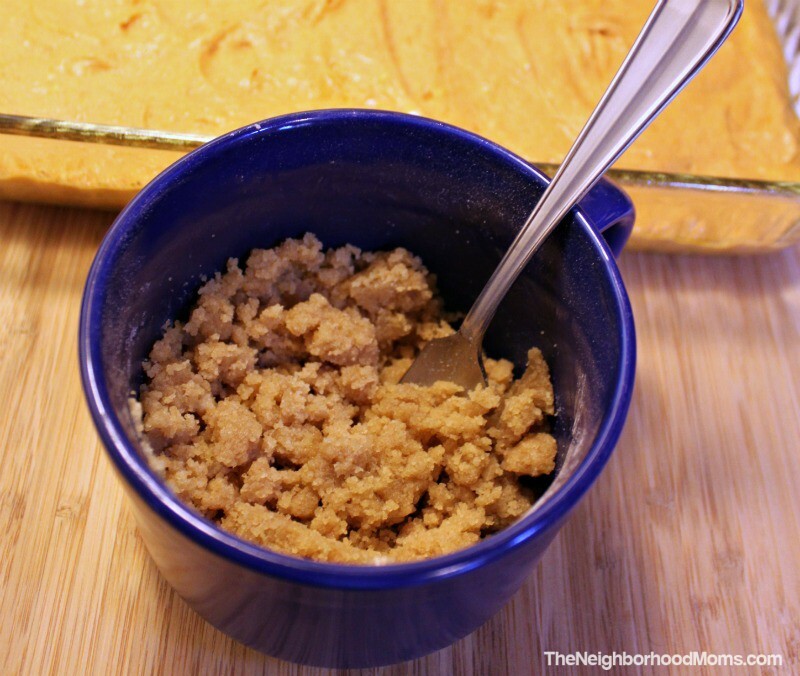 In a small bowl, or huge mug like I have, mix the flour, brown sugar, and melted butter together. Spread the crumble mixture evenly on top of the batter. If you like LOTS of crumble, you could double this part. Bake in the oven for 25-30 minutes or until a toothpick comes out clean. Resist the urge to dig right in, let cool before slicing. Your kitchen will smell AMAZING! Preheat the oven to 350 and spray a 13×9 baking dish with a nonstick spray. Mix the water, pumpkin, eggs, vanilla, and pumpkin pie spice together until well combined. Mix in the yellow cake mix and baking soda. Spread evenly in the baking dish. 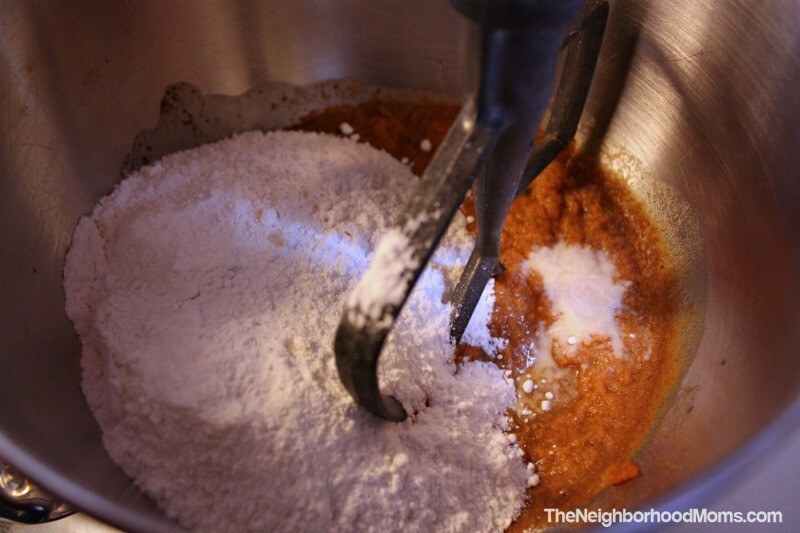 In a small bowl, mix the flour, brown sugar, and melted butter together. Spread the crumble mixture evenly on top of the batter. Bake in the oven for 25-30 minutes or until a toothpick comes out clean. This sounds awesome! We are carving pumpkins tonight and then I bought a couple of extra pumpkins to bake stuff. I am going to need good pumpkin recipes for the next couple of days as I use up the pumpkin, so this is too perfect. I craved pumpkin so bad last year when pregnant with my youngest. This year, the cravings have come back just as bad even though I’m not pregnant! I will take pumpkin any way – and this cake just looks so droolworthy! That looks delicious! I would sooo lick the batter, raw egg and all. Plus, I would probably double the crumble because, well – I like crumble. Thanks for sharing your recipe. Oh heavens, this sounds so delish! I love the crumbles on the top. The brown sugar sound soooo good! 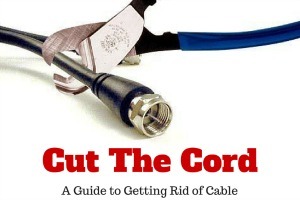 Now I am going to have to make this! Yum, yum, yum! I love pumpkin, and I love coffee cake. I have been baking up a storm recently. This will be my next project. Ha! You cracked me up with your love of pumpkin. 😉 I get pretty ridiculous about it too and my kids are really tired of pumpkin-everything over here, but I just can’t help it. This coffee cake sounds delicious. This looks amazing and I pinned it for later. 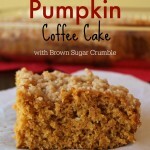 I love coffe cakes and pumpkin bread is my favorite and now I can have both YUM! This looks delicious, only thing I am missing is the can of pumpkin. I have pumpkin pie filling but not just pumpkin. Can’t wait to try it and the topping looks great. This would go great with a side of pumpkin spiced coffee or hot tea. Wow, thank you for this. The entire family loves pumpkin flavors. This looks incredible. We will be making this for sure. Thank you for sharing. I think my husband would love this! He loves coffee cake. Yum, that looks delicious!!! Perfect for fall! I haven’t had coffee cake in ages, I’ll have to give this recipe a try. Pumpkin is my favorite everything. I am going to eat this cake for breakfast and dessert for the rest of the fall. I am going to go with the double crumb option. Super excited about this, I could hug you right now. 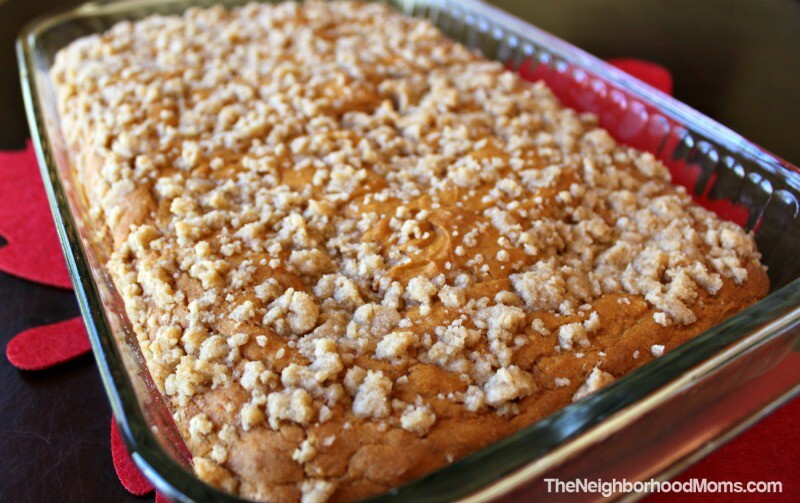 I am a big fan of coffee cake and this one sounds delicious! Love the crumble topping and addition of pumpkin. 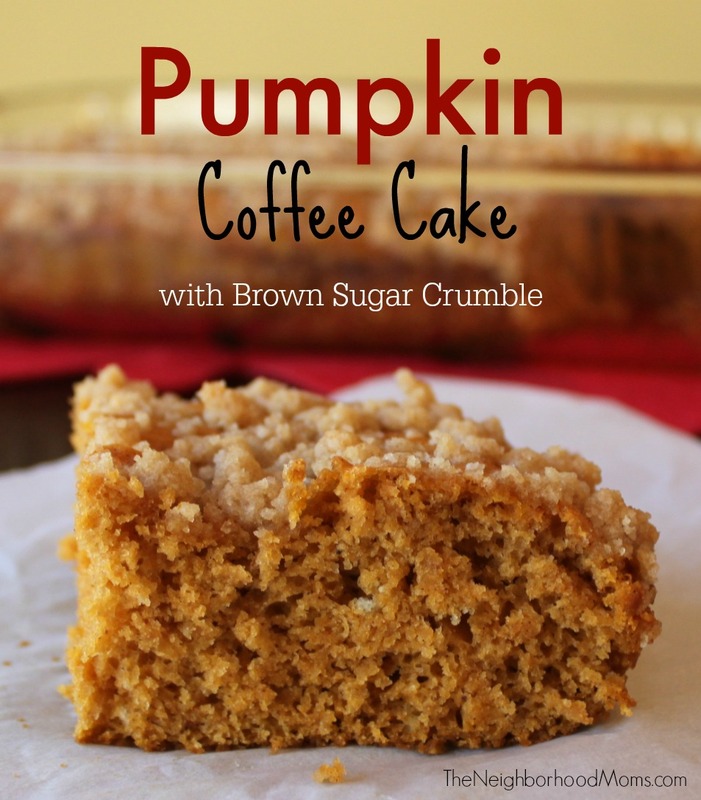 I”m not a huge pumpkin spice person, but THIS looks good, and I LOVE coffee cake. I’ve been looking for something to make to take to my daughter’s upcoming holiday bake sale and craft festival and I bet these would go over wonderfully, because unlike me, everyone else I know is absolutely crazy about pumpkin spice! YUM! This recipe look fantastic.I love crumb cake. Oh my I think this is going to be one of the very recipes I bake at the new house next month. I can just imagine the smells wafting through the house as we unpack. Thanks! I’m making this fir lunch snack today! This sounds great! My mom makes a pumpkin roll that we all really enjoy. I best share this one with her also. Oh this sure looks delicious! I’m all about pumpkin flavor right now. I love the crumble on top. That looks delicious! I am going to have to try this recipe! I don’t have a stand mixer – can I mix this by hand for the same result? Absolutely! I just tend to use my stand mixer for everything.